An Income Tax Loan is the answer when there just isn't enough money. There are few things more frustrating than adding up the bills and realizing that your paychecks aren’t lining up with the due dates. You’re responsible, and frugal, and keep track of your expenses and your income, and yet there are times when things still manage to slip out of balance. It happens to practically all of us, and when it does there are a few options to consider. One is rearranging the payment dates, another is borrowing money from family or a friend – and the last, and best, is an income tax loan. Did you know you can borrow against your potential tax refund, even without a W-2 in hand? You know that money’s coming – use it now when you need it most! Use Your Income Tax Loan For Whatever You Need Most! Bills might come to mind first, but there are dozens (hundreds!) of uses for an income tax loan. Are you driving around in a car that needs new brakes, new tires, or some kind of repair you’ve been putting off, waiting for the cash to be available? Don’t wait until you’re stuck by the side of the road, paying for a tow truck in addition to getting the car fixed! If the car’s ok, how about the house? Winter is on its way – would you rather pay a little now, or a lot on heating costs all winter long? An advance on your tax return could seal the windows and doors of any drafts, insulate your pipes and water heater, and make sure your home stays warm and toasty and cost-efficient straight through to spring! Have you been avoiding the doctor or dentist, hoping the problem would go away on its own, so your hard-earned cash could go toward more immediate needs? A small toothache today can be something much more dire in a short time – don’t wait any longer! There’s no need to, with such fast, easy income tax loans available! What if everything is paid up, the car is taken care of, there are no crises on the horizon… but you haven’t had a vacation in five years? What if everything’s in control, but the budget is tight – and you’d really, really like to get your spouse the laptop of their dreams for their birthday to replace the slow-as-snails ancient model they’ve been managing with for the past eight years? The new economy has changed life for a lot of people who had always been comfortable, always had extra cash, or at least always knew the bills would be paid. Just because the economy has been damaged and changed a lot of people’s circumstances doesn’t mean those people don’t still deserve happiness, gifts, vacations, and a comfortable life. We just might have to do a little juggling of our assets in order to make those things happen – and an income tax loan is a perfect way to take advantage of that sale or travel deal now, rather than having to spend more to get the same thing later! Lenders who offer income tax loans don't care why you want the cash. They only care about three basic things: Are you a U.S. citizen? Are you at least 18? And do you receive a regular income of some sort? If you answered "yes" to each of those questions, you're well on your way to being qualified for an income tax loan. Complete your application, and you could have money in your account within one business day. How's that for fast? And the application is so simple that it should only take you a couple of minutes to complete, and you'll hear from a lender in just minutes. It truly couldn't be easier or faster, so don't wait. Spend smart, live well, and be happy! A tax refund loan can be a great option for you if you have unexpected expenses. Maybe you got in a car accident and don’t have the money left in your account to pay the insurance deductible for the needed repairs. Or your spouse suddenly lost her job and you were counting on her next paycheck to take care of this month’s bills. Whatever your needs are, tax refund installment loans can be the relief you need. Typical tax refund loans from most lenders are small, personal loans that are backed by your regular paycheck. You get a small amount, $500 for example, based on the fact that you have a job with a bi-weekly or monthly payday. Use the cash however you need to, pay it back with your next paycheck, and your debt is gone. Sometimes, though, you need a little more money, and this is where installment loans can be useful. Installment loans are those that you pay back on a set schedule, usually because they are for a larger amount. Because you are borrowing more money, you can’t be expected to pay it back in one lump sum with your pay check. You set a schedule with the lender, and make payments over a period of several weeks or months. Tax refund installment loans are a great option when you need more cash, and you know that you can repay it if given a schedule to follow. Will I Be Approved for Large Installment Loans? Like a tax refund loan, your installment loan is based on your regular paycheck. The amount you will be approved for depends on your income and how much you can afford. To use tax refund installment loans responsibly, you should only ask for as much as you can reasonably afford to pay back. The application and approval processes are simple and quick. You just need to fill out an easy application, and provide evidence of your age, residency status and paycheck, and you are likely to be approved. Best of all, most lenders will not need to see your credit score, so bad credit isn't a problem. Sometimes life throws you a curve ball and all of your careful financial planning goes out the window. In these moments you have choices. Look for tax refund installment loans that offer easy approval and will give you the opportunity for a repayment schedule. Use these loans wisely, pay them back on time, and you can relax in the face of an unexpected financial crisis. When you need cash quickly and you’re expecting a tax refund, contact iTaxAdvance.com. You can get the money you’re owed, much sooner with one of their easy and simple tax advance loans. It doesn’t matter what you need the cash for, or what your credit score is like, a tax advance loan is accessible to nearly anyone. 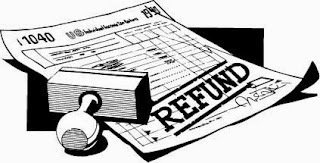 As long as you are owed a refund, you can get it now, thanks to iTaxAdvance.com. Read these tax advance reviews from actual users, and see how a tax advance loan can help you out when you need it most. I turned to iTaxAdvance.com last year when I was in a pretty desperate situation. My husband lost his job and with it went our major source of income and our health insurance. We knew he would be able to get a new job, but it would take some time. We had bills to pay and not having health insurance was scary. I felt like I couldn’t let the kids out of the house for fear they would get hurt or sick. We just didn’t have the money to stretch to medical bills. After reading several tax advance reviews, I decided to use iTaxAdvance.com. I filled out the application, spoke to a lender on the phone, and by the next day I had an extra $500 in my bank account. We were able to pay our bills and make our money last until my husband found a new job. They made it so easy to get the money we knew was coming from our tax refund. It was like getting our refund early, and it took a huge weight off of my shoulders. –Sherry H., MN. My wife and I really wanted to take a vacation last spring, but we were short on money. We work hard and still live mostly paycheck to paycheck. When we found out that our tax refund would be enough to take a trip to Florida, we were thrilled. Then we realized we wouldn’t get the cash in time to stay with friends in Tampa. I had heard about tax advance loans and a coworker pointed me to iTaxAdvance.com. After reading several tax advance reviews for the site, I felt comfortable filling out the application. The process was easy, the fees were reasonable, and we got the money we needed to secure the deposit on our vacation rental. We had a fabulous time, and we were able to pay back our loan with our expected tax refund. The process couldn’t have been easier. Thanks so much for all your help, iTaxAdvance.com! –Jim R., ND. I've Read the Tax Advance Reviews. What's My Next Step? When you have a need for cash and the government is dragging its feet to get your refund to you, turn to iTaxAdvance.com. They can get you the cash the next day so you can relax and enjoy the security of having the money you need in your account. You've read the great reviews, so why wait any longer? Click here to complete your application and get the money you need. When you know you will be getting a refund from the IRS you might start dreaming of how you’ll use the money. Maybe you’re expecting to get enough money back to take that Caribbean cruise you’ve been dreaming about. You might have debt that you would love to pay off so you can stop paying interest. Maybe you have a loved one in a tough situation, and you would love to help out by giving him a little extra cash. All of these dreams may be put on hold if you have to wait weeks or months to get your tax refund check. Instead of waiting, take advantage of a tax anticipation loan. A tax anticipation loan is a small, short-term personal loan that you can get based on your expected tax refund amount. When you file your tax return early in the year, it feels great to get it done. It also feels great when you realize that all your hard work over the last year has netted you a sizable refund. The government is not usually quick to get that money back to you, though. If you can prove that you are owed a certain amount of money, based on your filed taxes, you can get it right away. A loan provider specializing in tax anticipation loans, like IncomeTaxAdvances.com, will get you the cash in a day or less. That means you can use the money sooner for whatever you need or want. What Do I Need to Do to Get a Tax Anticipation Loan? The first step is to complete and file your tax return. No one enjoys this chore, but the sooner you take care of it, the sooner you can get the money you’re owed. Once you know the amount of your refund, apply for a tax anticipation loan for that amount or less. Applying is easy; just click here and spend a minute or two completing the simple application. Show proof of your expected refund, and wait seconds to be approved for the loan. By the next day, or possibly even the same day, you will see the cash in your bank account. Pay back the loan and the associated fees when you get your refund check in the mail. Getting your tax refund sooner has never been easier when you take advantage of a tax anticipation loan.